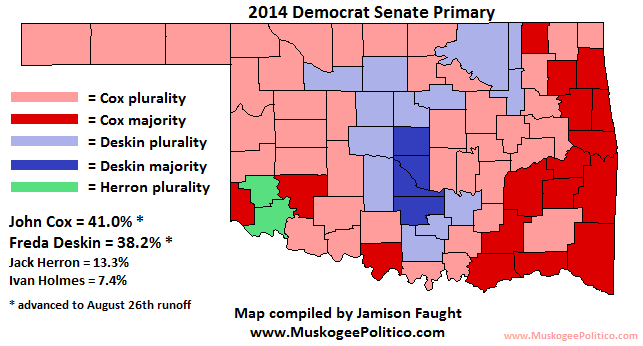 While I was working on the Democrat's Senate primary map, I decided to also do their State Superintendent primary. Since, the GOP side was unexpectedly lopsided (Joy Hofmeister won every county, and incumbent superintendent Janet Barresi came in third out of three candidates), I was curious to see the other side. John Cox came out on top with 68,889 votes, Freda Deskin was a close second with 64,135, while Jack Herron had 22,335 and Ivan Holmes got 12,504. Cox and Deskin are now in a runoff, the winner of which will face Hofmeister in the general election. Cox received over 70% of the vote in some far eastern counties, while Deskin ran in the upper 40s and low 50s in the OKC and Tulsa metros.